Grip holder with adjustable arms can be modified to fit most electronic devices, including smartphones, MP3 players and GPS devices. Long, flexible, durable gooseneck bends and adjusts to your desired position. 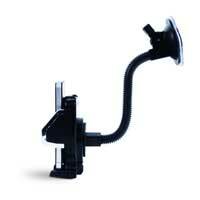 Rotating windshield mount features a Quick Lock and Release Lever for easy installation and removal. Easily transferred from one vehicle to another. Provides easy access to your device's buttons and functions. 6.38" x 9.75" x 3.13"